Who would’ve thought that the greatest, most effective showcase of virtual reality’s strengths would be accomplished by a third-person action adventure? With Moss, Polyarc has taken an old, familiar genre and turned it into one of the most affecting and engaging VR games I’ve had the pleasure to experience. 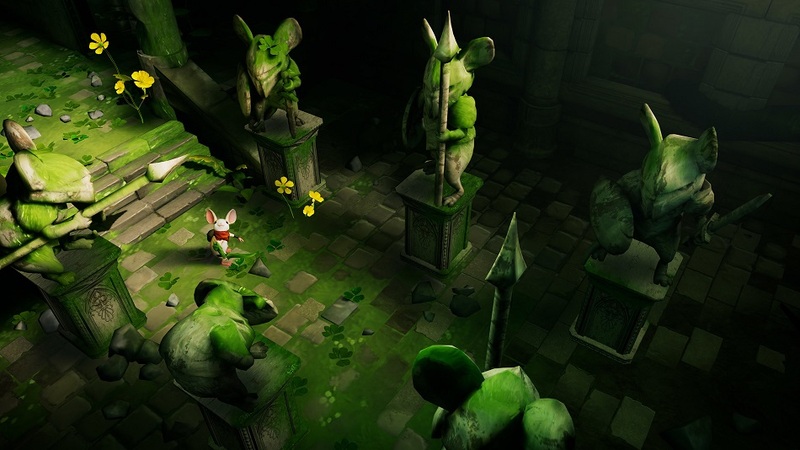 Moss takes place in a fantasy storybook populated with mice wielding swords and squirrels wearing armor. 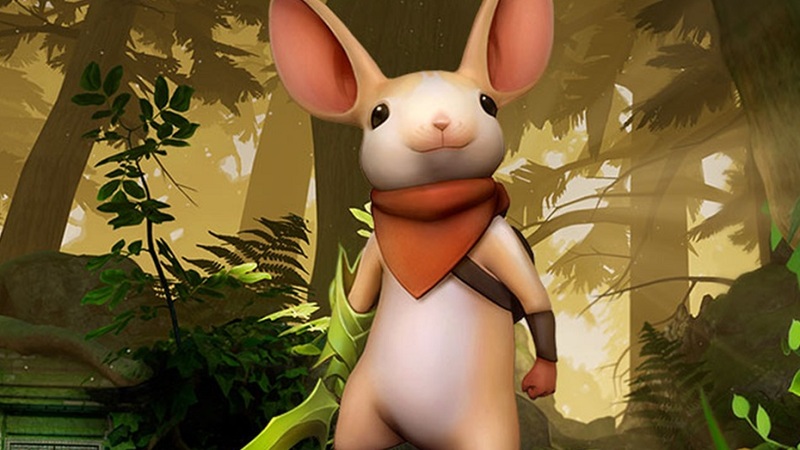 The main character is a mouse named Quill who’s in search of her uncle. Interestingly, my role as the player was split between Quill and an incorporeal presence known as The Reader. While I controlled Quill’s movements directly with the joystick and buttons, I controlled The Reader by moving my controller around in space. By taking advantage of the DualShock’s motion sensors, I could manipulate single enemies, move platforms, and even pick Quill up and recharge her health when she was in danger. Apart from these basic functions, there were many small interactions that, while having absolutely no effect on the gameplay, completely sold me on my role as Quill’s guardian, rather than being Quill herself. In reflective pools, I could lean over and see my masked face hovering above Quill’s world. After tough battles, Quill would jump joyously, communicate to me with sign language, or hold out her hand for a surprisingly tactile high five. Small touches like these are the often sought but rarely achieved “final mile” element of videogame immersion that takes Moss into a truly special territory. Another aspect that Moss nails is a strength of virtual reality that’s often overlooked — sense of scale. Whereas most VR games employ the unsurprising awe of giant creatures that dwarf my own presence, Moss reverses this to arguably better effect. As Quill ran through each dioramic mixture of forest floor and castle, I gained a clear sense of how small she was in relation to her world. Along with this came an appreciation for the courage that compelled her to forge on, and in turn, I was compelled to protect this brave little creature. All of this relationship building would be for naught if Moss didn’t absolutely nail the gameplay mechanics, but they’re on point. At its core, it feels like a solid evolution of classic 2D adventure with room-to-room puzzle platforming and simplistic hack-and-slashery. Each room was a new, self-contained environment where I manipulated platforms and controlled enemies while Quill navigated her way through dangers. Spending time pulling at metal shields to block incoming cannon fire, misdirecting enemy movements, and executing stick-and-move attacks was exciting and satisfying, and created a powerful sense of teamwork despite Quill’s apparent fragility. Although Moss is relatively short at around four hours long, it was firing on all cylinders at the end, the final portion of the adventure brings the beautiful score, lush visuals, and tight, varied mechanics into a unified whole that’s pushed at a frenetic pace into a satisfying climactic end. I found myself completely exhilarated and thrilled. Disclosures: This game is developed and published by Polyarc, Inc. It is currently available on PSVR. This copy of the game was obtained via publisher and reviewed on the PSVR. Approximately 6 hours of play were devoted to the single-player mode, and the game was completed. There are no multiplayer modes. Parents: According to the ESRB, this game is rated E for Everyone and contains Mild Fantasy Violence. There are a couple instances where the sight of Quill dying could be troubling for young children. Deaf & Hard of Hearing Gamers: All story elements can be conveyed via subtitles and sound has no significant bearing on the gameplay. Notably however, Quill does communicate at times with the player via American Sign Language.